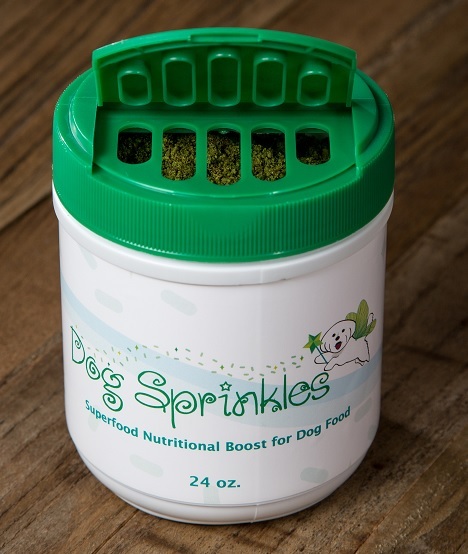 "Making Dogs Healthier So They Can Live Longer"
The convenient flip-top lid makes adding these life-enhancing superfood sprinkles to your dog's food easy. Give the food you already feed your dog a superfood nutritional boost with Dog Sprinkles. Most dog food products in the market today are highly processed and filled with preservatives. Even more expensive brands that claim to be healthier are exposed to high temperatures during processing, destroying most of the living enzymes, minerals, and vitamins in their ingredients, making them much less nutritious. Restore what is missing from your dog's food with Dog Sprinkles, a blend of organic, whole food ingredients that include superfoods like hemp seeds, goji berries, sprouted flax powder, nori flakes, spirulina, and more. Dog Sprinkles is available in two sizes, a small 12 once container and a large 24 once container. Eco-friendly refill packets are available for those who want a sustainable option. Why Is Choosing a Whole Food Product Important? Superfoods are a class of foods that are the most nutrient- dense, benefit rich foods found in nature. Superfoods are foods that rank the highest on the ANDI (Aggregate Nutrient Density Index) and ORAC (Oxygen Radical Absorbance Capacity) rating systems which are used to compare nutrient density and antioxidant levels in foods. 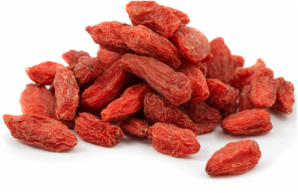 For example, ORAC gives goji berries a score of 13,300 in terms of antioxidant level compared to kale, spinach, carrots, and mangos which only score 3,000 or less. Another key to understanding superfoods is the concept of nutrient density, defined as the ratio of calories to micronutrients found in a food. Micronutrients encompass vitamins, trace minerals, antioxidants, phytochemicals, and organic acids which are needed for balanced nutrition in small amounts. Because these micronutrients are not found in many foods, superfoods also provide the most concentrated sources of these nutrients per calorie. A whole food product means that the nutrients within the foods used in that product are "closest to source" and therefore maintain their original co-factors that allow for optimum absorption. Consuming foods in their whole food form, rather than in processed or fortified forms, optimizes the absorption rate. Therefore, when foods undergo extreme processing (such as occurs with many dog food products and canine supplements in the market today), their nutrients become less able to be absorbed. And the extreme temperatures used during such processing further destroys the living enzymes, vitamins, and minerals in these foods, making these dog food and supplement products less nutritious as well as less able to be absorbed. 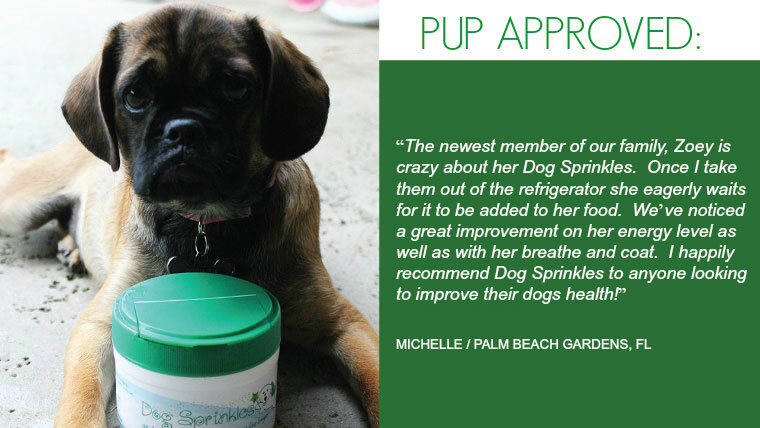 "I was intrigued by the improving health of Stephanie's older dogs which is how I came to learn about Dog Sprinkles. I tried the product on my own dogs and found it not only to provide health benefits, but also was something my dogs absolutely loved. In fact, my dogs eat around their food to get the sprinkles! As a professional veterinarian for 17 years, I believe this product can help with the health and longevity of our dog friends. I will be recommending it to all my dog owning clients." Here is a simple recipe for healthy superfood dog treats using Dog Sprinkles. These treats are loaded with healthy omega fatty acids which make them great for your dog's coat, skin, eye, heart, and brain health. Preheat oven to 375°F. Prepare the chia “egg” by combining chia seeds with the water. Let sit for about 15 minutes until gelatinous. In a food processor, blend almond flour, brown rice flour, rolled oats, Dog Sprinkles, goji powder, and Parmesan cheese. Add in the sardines, including the oil they are canned in, and the chia egg. Blend until well mixed. Mixture will form a soft dough ball when ready. Remove mixture from food processor and begin to roll, about ½–1 tablespoon of mixture, into small balls and then press them into flat small biscuit cookies. Place on a cookie sheet, lined with parchment paper. Bake for 15 minutes or until lightly brown. Cool and serve. 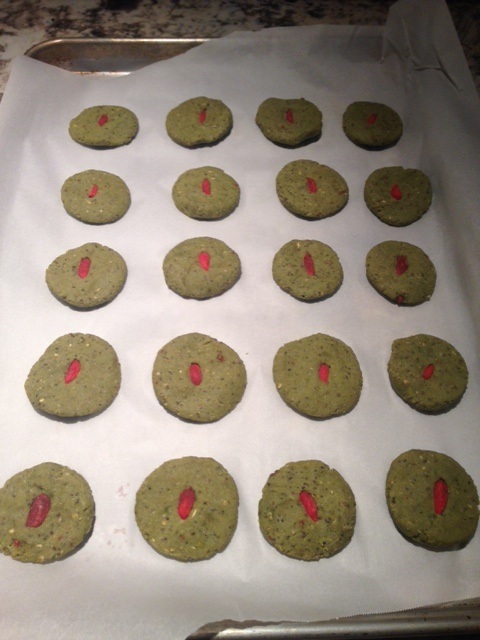 Add a goji berry to the center of each biscuit cookie for a little something extra. Make these treats using your Dog Sprinkles! 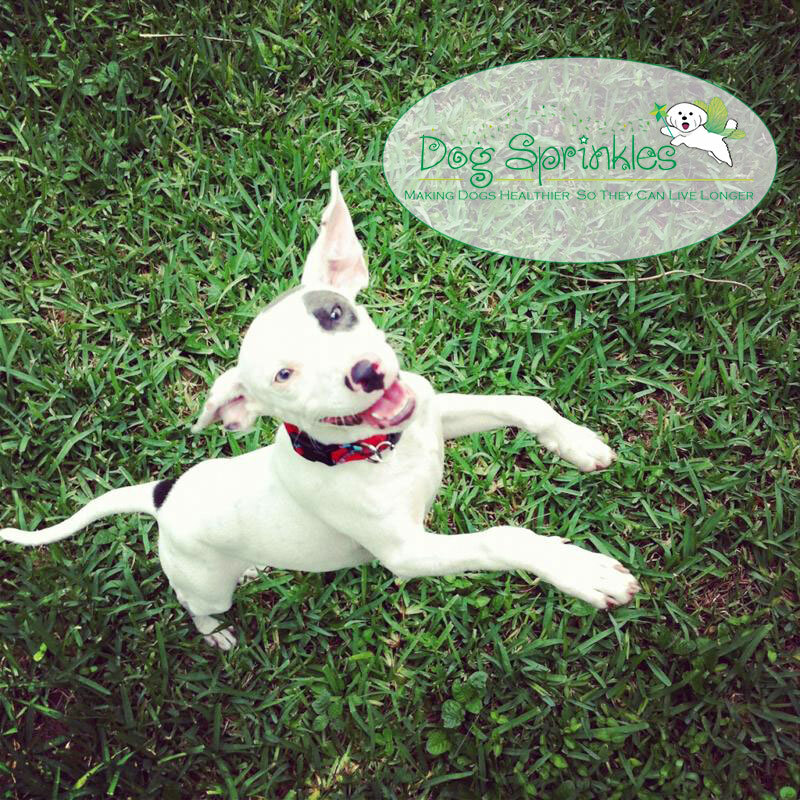 Here is a great dog food recipe you can make at home using Dog Sprinkles! Preheat oven to 375°F. In a food processor, blend yams, apple, and kale together until well blended. Next, add in coconut oil, Dog Sprinkles, chia seeds, and nori flakes. In a large mixing bowl, add the ground turkey, puree, rolled oats, almond flour, Parmesan cheese, and pinch of salt. Mix well. In a 12-cup muffin tin lightly greased, or lined with muffin liners, scoop mixture into each cup (I find using an ice cream scooper the easiest way to do this). Bake for 15-20 minutes. Let cool and store in refrigerator. Makes about 16 meals. Homemade dog food using your Dog Sprinkles! Ready To Expand Market Distribution: We are currently in the market for a manufacturer and/or wholesaler interested in licensing Dog Sprinkles for wider market penetration. If you are in this line of business, or have relevant contacts in same, please contact us. And thank you for your assistance in helping more dogs live longer, healthier lives!